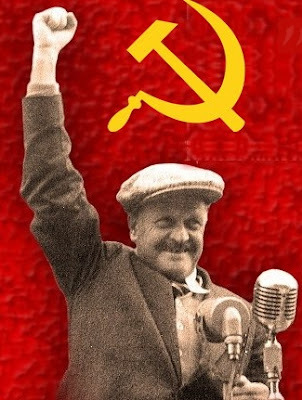 The great Turkish Communist poet, Nazım Hikmet, died on 3 June 1963 in Moscow. He was an extraordinary personality, not only for his country but for whole world. A consistent marxist-leninist who never betrayed his beliefs. A real internationalist and a true patriot. A man who, through his unique writing skills and inspiration, became a symbol: A poet of the world's proletariat. 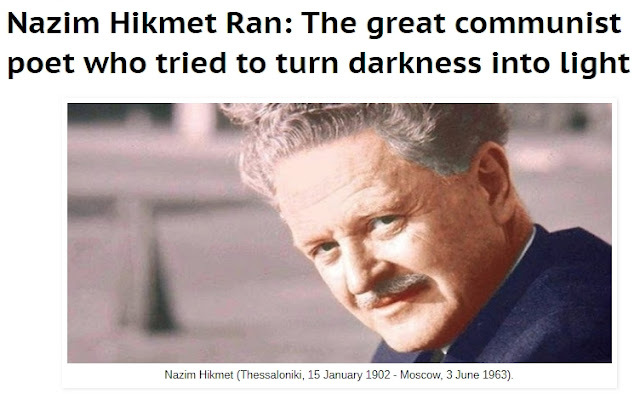 The flame of Hikmet's magnificent poetry which set hearts on fire can not be extinguished, as long as there are people who continue the struggle for a better world, without exploitation of man by man. Born in 1902, Nazim Hikmet was always present, through his poems and writings, in the major issues of his times. His heart - "one red apple" - was beating in the rhythm of the class struggle, of the fight against injustice and oppression. "You will say, the stars are far away and out earth is so, so small. Well, then, whatever they are, the stars [...] For me, anyway, the most amazing thing, the most imposing, most mysterious and biggest thing is a human being whom they obstruct from walking, is a human being whom they have bound in chains." Fifty-five years since his death, Nazim Hikmet is still with us. And will always be. Because his poems will always accompany the struggle of the working class, the struggle of the people, for a society without exploitation of man by man, for socialism-communism.